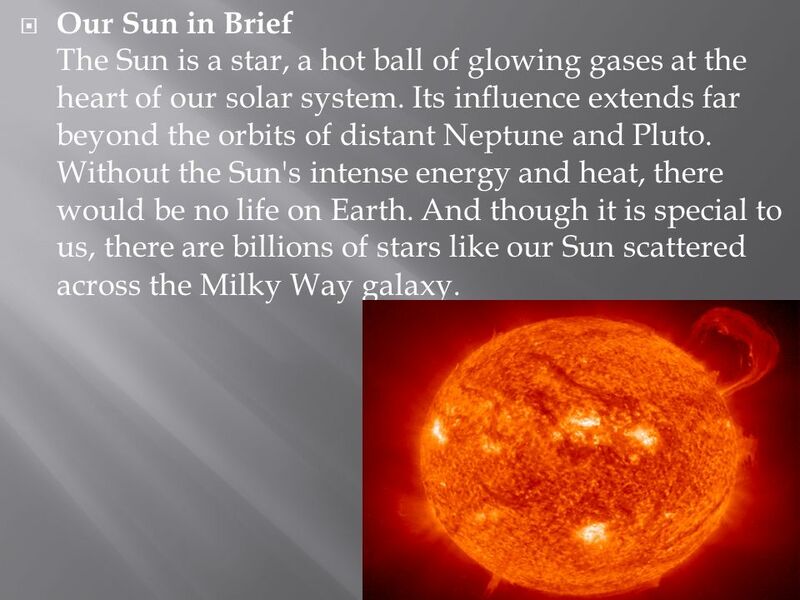 3 Our Sun in Brief The Sun is a star, a hot ball of glowing gases at the heart of our solar system. Its influence extends far beyond the orbits of distant Neptune and Pluto. Without the Sun's intense energy and heat, there would be no life on Earth. And though it is special to us, there are billions of stars like our Sun scattered across the Milky Way galaxy. 4 Mercury in a Brief Sun-scorched Mercury is only slightly larger than Earth's Moon. Like the Moon, Mercury has very little atmosphere to stop impacts and it is covered with craters. Mercury's dayside is super heated by the Sun, but at night temperatures drop hundreds of degrees below freezing. Ice may even exist in craters. Mercury's egg-shaped orbit takes it around the Sun every 88 days. 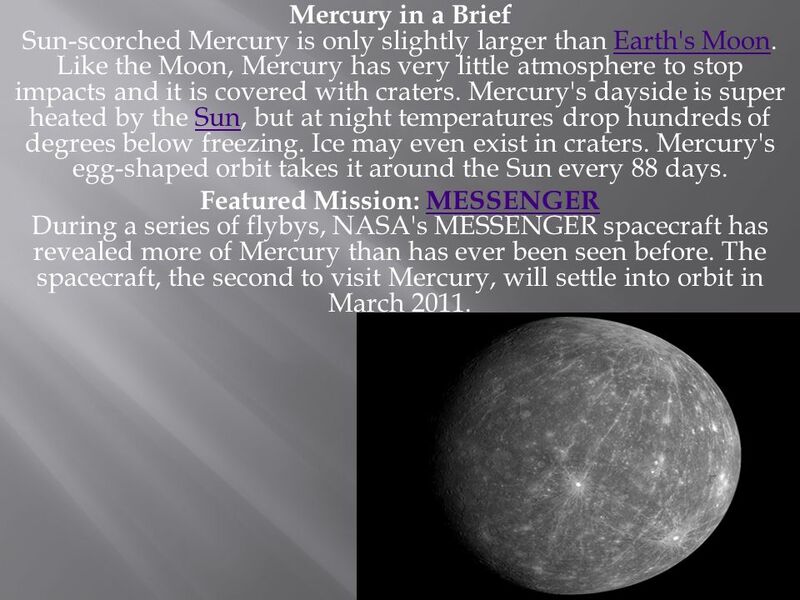 Featured Mission: MESSENGER During a series of flybys, NASA's MESSENGER spacecraft has revealed more of Mercury than has ever been seen before. The spacecraft, the second to visit Mercury, will settle into orbit in March 2011. 5 Venus in Brief Venus is a dim world of intense heat and volcanic activity. Similar in structure and size to Earth, Venus' thick, toxic atmosphere traps heat in a runaway 'greenhouse effect.' The scorched world has temperatures hot enough to melt lead. Glimpses below the clouds reveal volcanoes and deformed mountains. Venus spins slowly in the opposite direction of most planets. 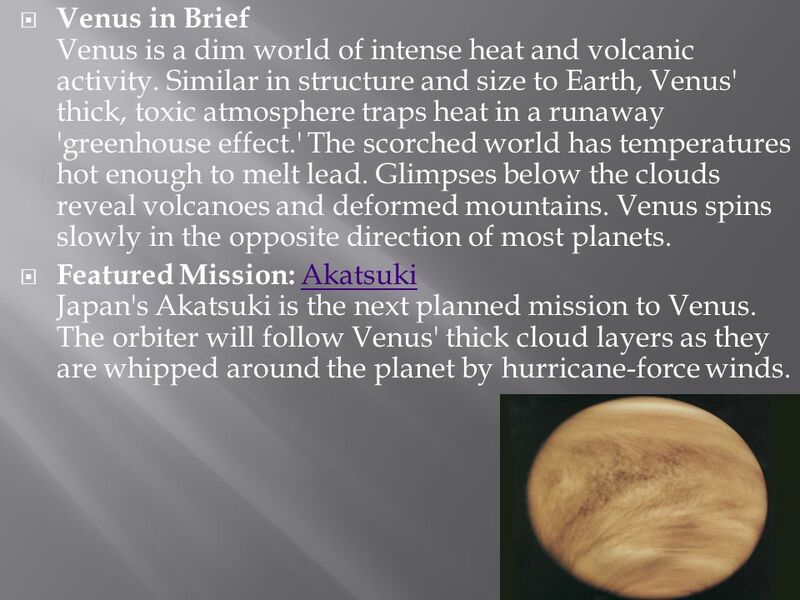 Featured Mission: Akatsuki Japan's Akatsuki is the next planned mission to Venus. The orbiter will follow Venus' thick cloud layers as they are whipped around the planet by hurricane-force winds. Earth in Brief Earth is an ocean planet. Our home world's abundance of water - and life - makes it unique in our solar system. Other planets, plus a few moons, have ice, atmospheres, seasons and even weather, but only on Earth does the whole complicated mix come together in a way that encourages life - and lots of it. 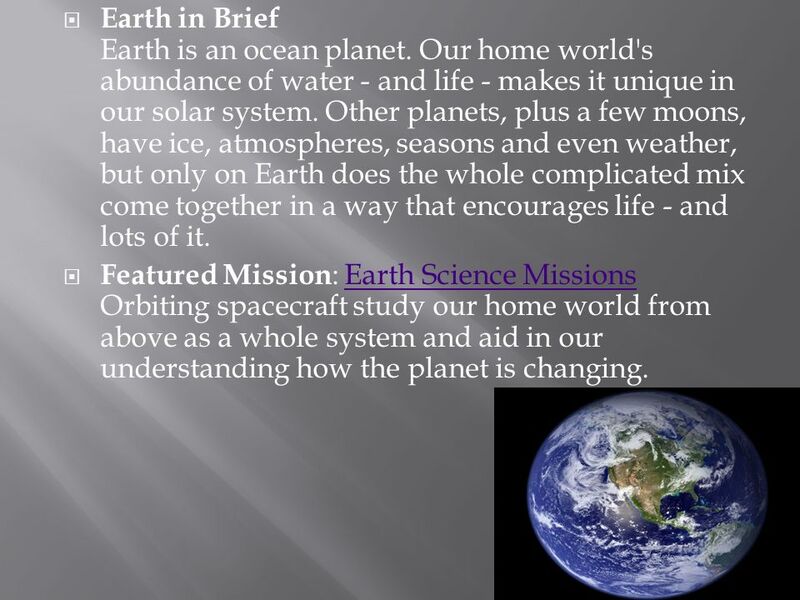 Featured Mission: Earth Science Missions Orbiting spacecraft study our home world from above as a whole system and aid in our understanding how the planet is changing. 7 Earth's Moon in Brief Our moon makes Earth a more livable planet by moderating our home planet's wobble on its axis, leading to a relatively stable climate, and creating a rhythm that have guided humans for thousands of years. The Moon was likely formed after a Mars-sized body collided with Earth and the debris formed into the most prominent feature in our night sky. 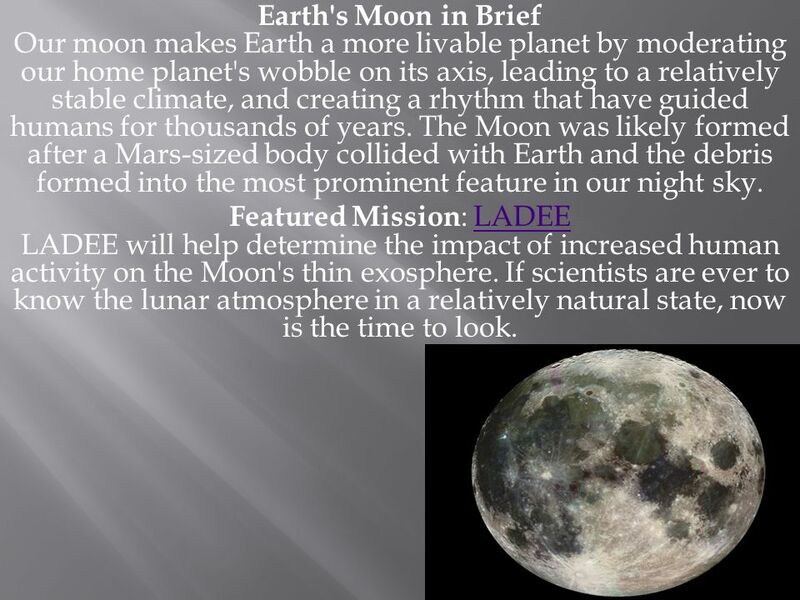 Featured Mission: LADEE LADEE will help determine the impact of increased human activity on the Moon's thin exosphere. If scientists are ever to know the lunar atmosphere in a relatively natural state, now is the time to look. 8 The red planet Mars has inspired wild flights of imagination over the centuries, as well as intense scientific interest. 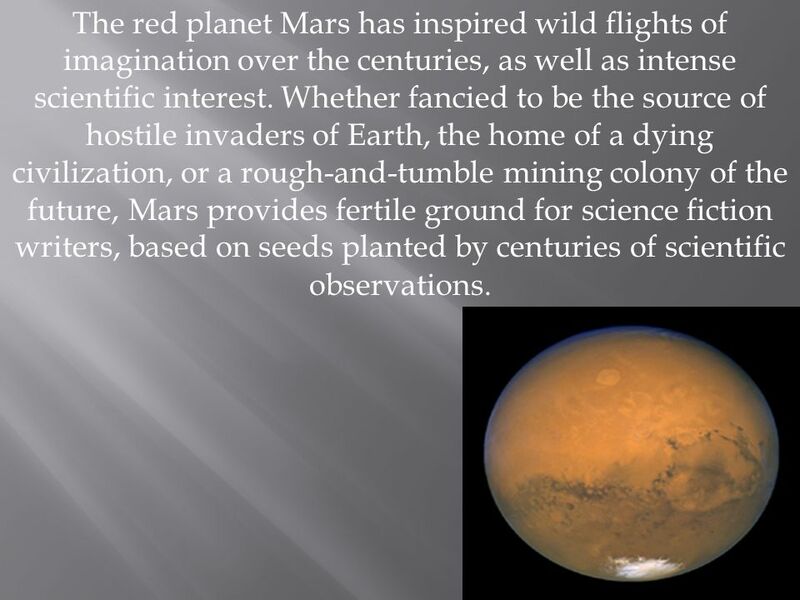 Whether fancied to be the source of hostile invaders of Earth, the home of a dying civilization, or a rough-and-tumble mining colony of the future, Mars provides fertile ground for science fiction writers, based on seeds planted by centuries of scientific observations. 9 Asteroids in Brief Asteroids are rocky, airless worlds that orbit our Sun, but are too small to be called planets. Tens of thousands of these 'minor planets' are gathered in the main asteroid belt, a vast doughnut-shaped ring between the orbits of Mars and Jupiter. Asteroids that pass close to Earth are called near-earth objects. 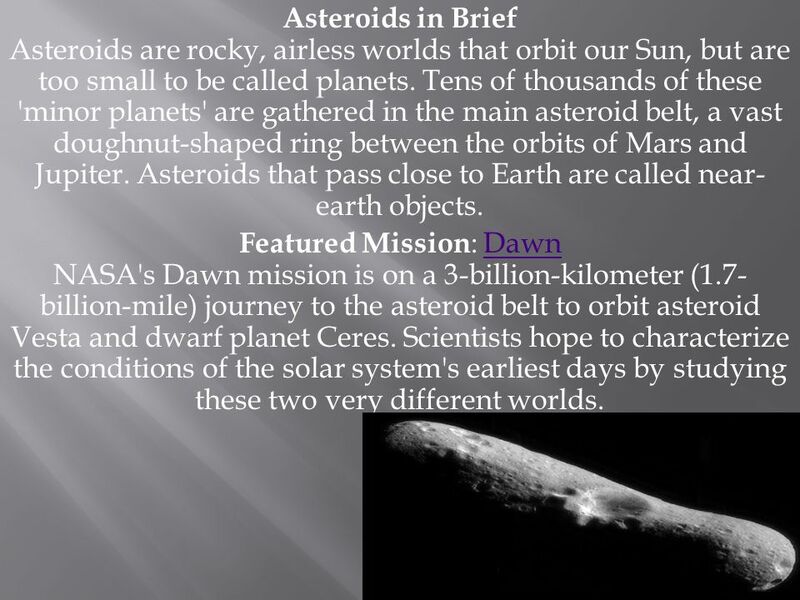 Featured Mission: Dawn NASA's Dawn mission is on a 3-billion-kilometer (1.7-billion-mile) journey to the asteroid belt to orbit asteroid Vesta and dwarf planet Ceres. Scientists hope to characterize the conditions of the solar system's earliest days by studying these two very different worlds. 10 The most massive planet in our solar system, with four planet-sized moons and many smaller moons, Jupiter forms a kind of miniature solar system. Jupiter resembles a star in composition. In fact, if it had been about eighty times more massive, it would have become a star rather than a planet. 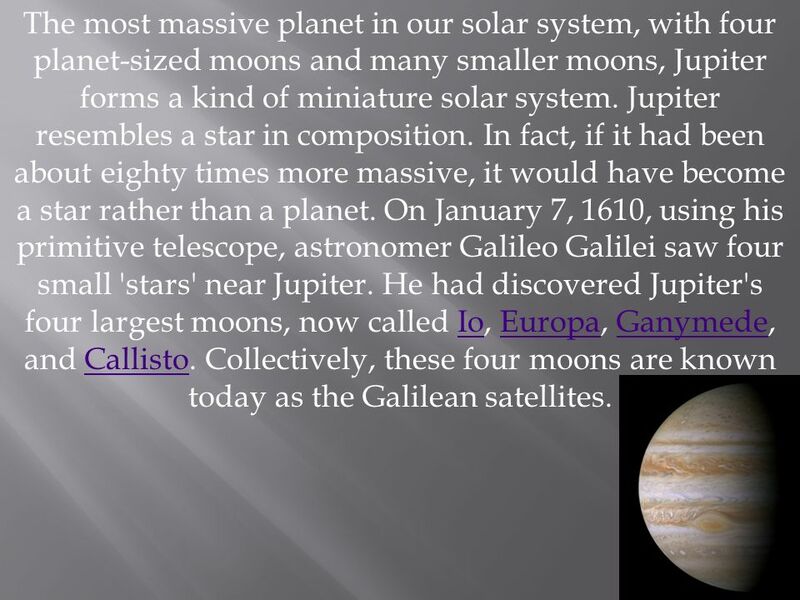 On January 7, 1610, using his primitive telescope, astronomer Galileo Galilei saw four small 'stars' near Jupiter. He had discovered Jupiter's four largest moons, now called Io, Europa, Ganymede, and Callisto. Collectively, these four moons are known today as the Galilean satellites. Saturn was the most distant of the five planets known to the ancients. Like Jupiter, Saturn is made mostly of hydrogen and helium. Its volume is 755 times greater than that of Earth. Winds in the upper atmosphere reach 500 meters (1,600 feet) per second in the equatorial region. 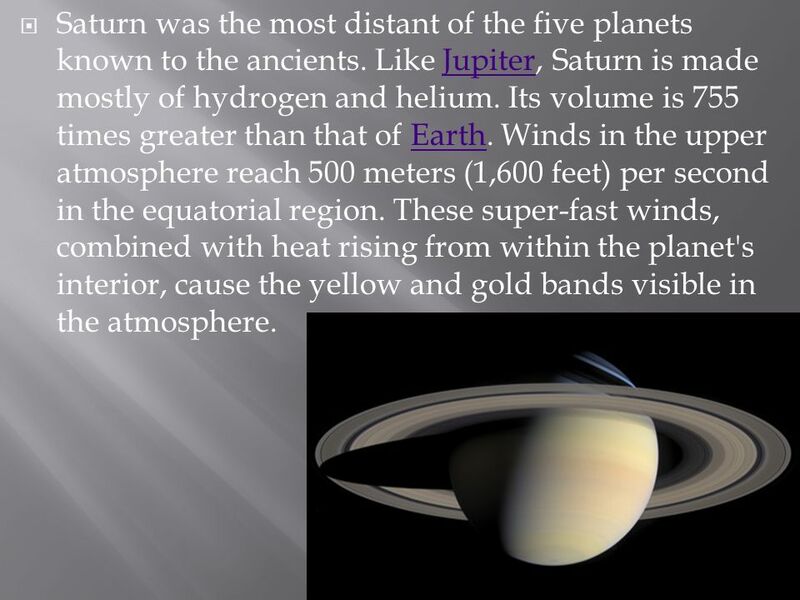 These super-fast winds, combined with heat rising from within the planet's interior, cause the yellow and gold bands visible in the atmosphere. 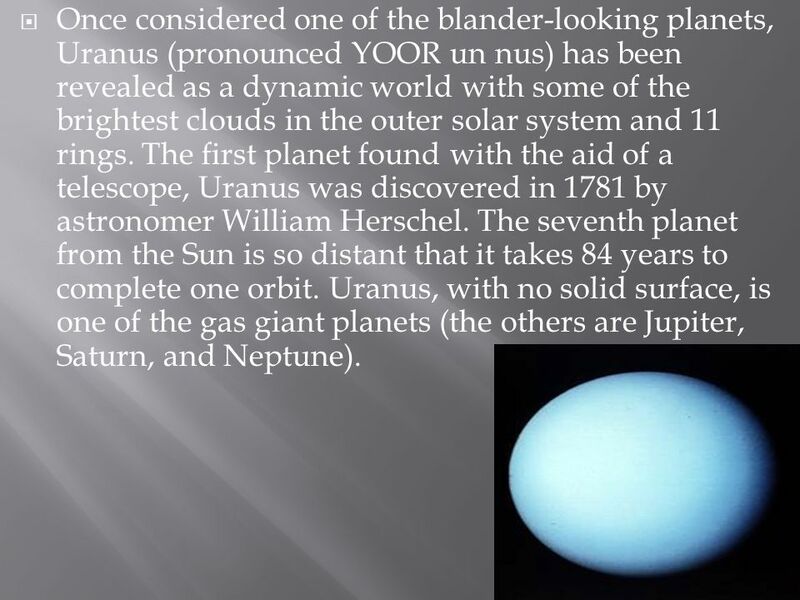 12 Once considered one of the blander-looking planets, Uranus (pronounced YOOR un nus) has been revealed as a dynamic world with some of the brightest clouds in the outer solar system and 11 rings. The first planet found with the aid of a telescope, Uranus was discovered in 1781 by astronomer William Herschel. The seventh planet from the Sun is so distant that it takes 84 years to complete one orbit. Uranus, with no solid surface, is one of the gas giant planets (the others are Jupiter, Saturn, and Neptune). 13 The eighth planet from the Sun, Neptune was the first planet located through mathematical predictions rather than through regular observations of the sky. (Galileo had recorded it as a fixed star during observations with his small telescope in 1612 and 1613.) When Uranus didn't travel exactly as astronomers expected it to, a French mathematician, Urbain Joseph Le Verrier, proposed the position and mass of another as yet unknown planet that could cause the observed changes to Uranus' orbit. 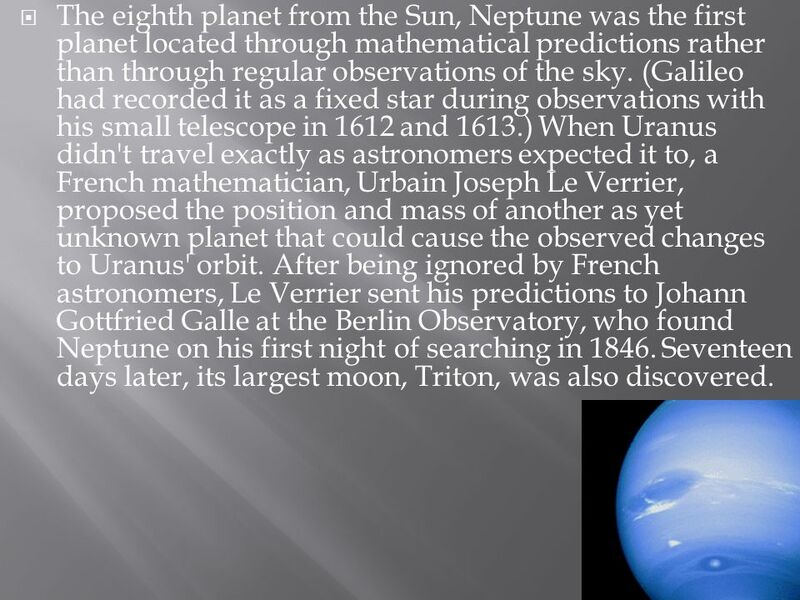 After being ignored by French astronomers, Le Verrier sent his predictions to Johann Gottfried Galle at the Berlin Observatory, who found Neptune on his first night of searching in Seventeen days later, its largest moon, Triton, was also discovered. 14 Pluto in Brief Tiny, cold and incredibly distant, Pluto was discovered in 1930 and long considered to be the ninth planet. But after the discoveries of similar intriguing worlds even farther out, Pluto was reclassified as a dwarf planet. This new class of worlds may offer some of the best evidence of the origins of our solar system. Featured Mission: New Horizons NASA's New Horizons will be the first spacecraft to visit Pluto and the Kuiper Belt. 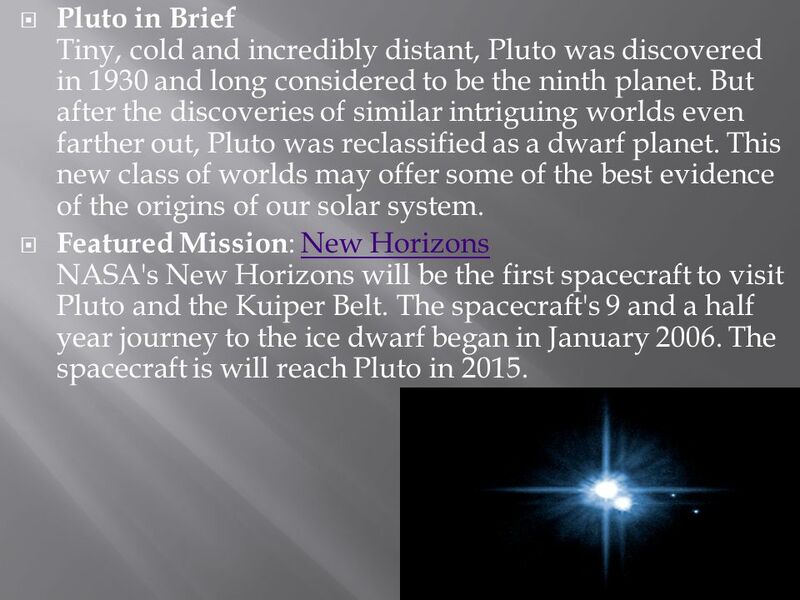 The spacecraft's 9 and a half year journey to the ice dwarf began in January The spacecraft is will reach Pluto in 2015. 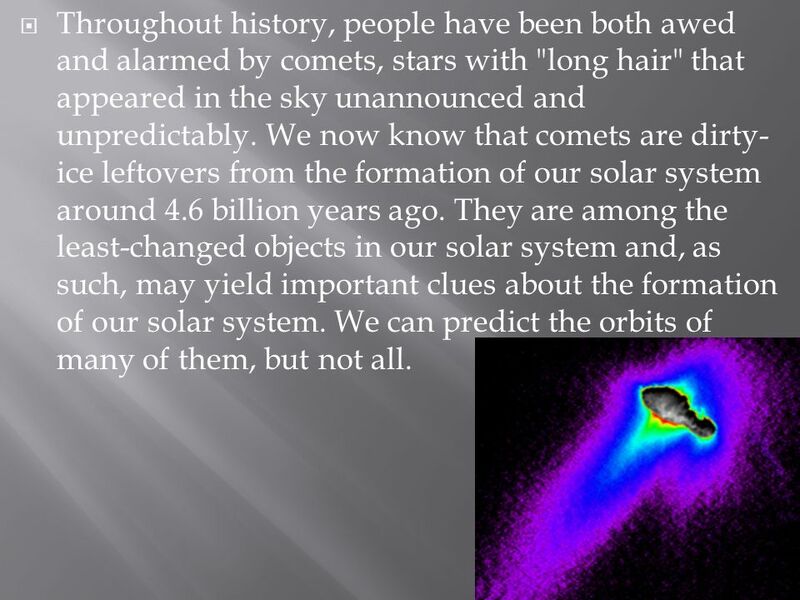 15 Throughout history, people have been both awed and alarmed by comets, stars with "long hair" that appeared in the sky unannounced and unpredictably. We now know that comets are dirty-ice leftovers from the formation of our solar system around 4.6 billion years ago. They are among the least-changed objects in our solar system and, as such, may yield important clues about the formation of our solar system. We can predict the orbits of many of them, but not all. 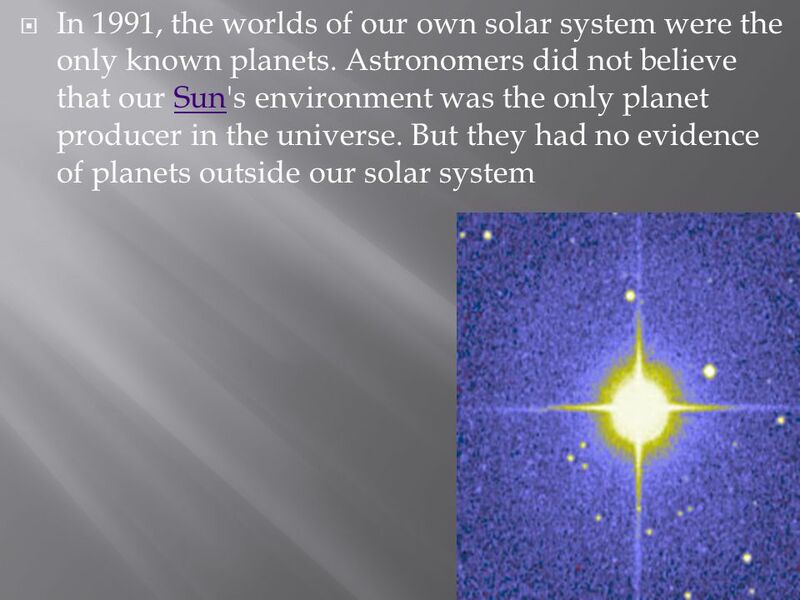 What constitutes a planet? 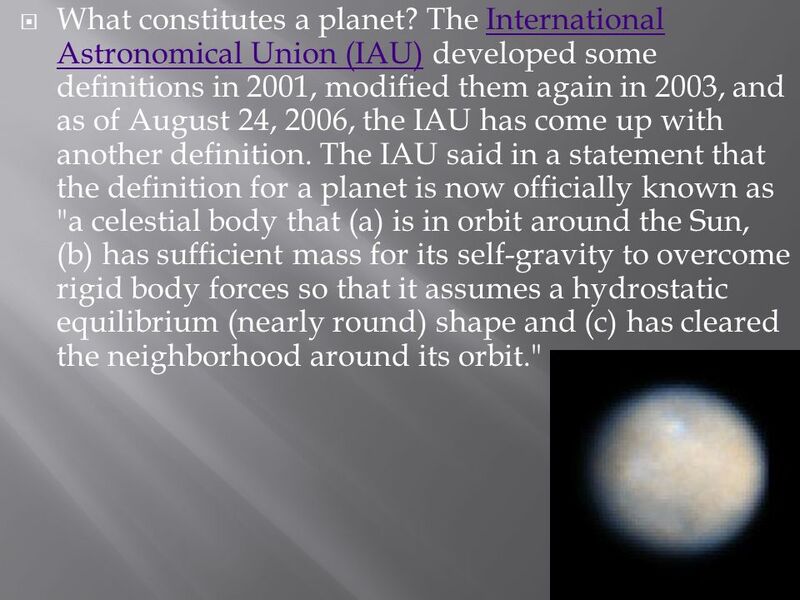 The International Astronomical Union (IAU) developed some definitions in 2001, modified them again in 2003, and as of August 24, 2006, the IAU has come up with another definition. The IAU said in a statement that the definition for a planet is now officially known as "a celestial body that (a) is in orbit around the Sun, (b) has sufficient mass for its self-gravity to overcome rigid body forces so that it assumes a hydrostatic equilibrium (nearly round) shape and (c) has cleared the neighborhood around its orbit." 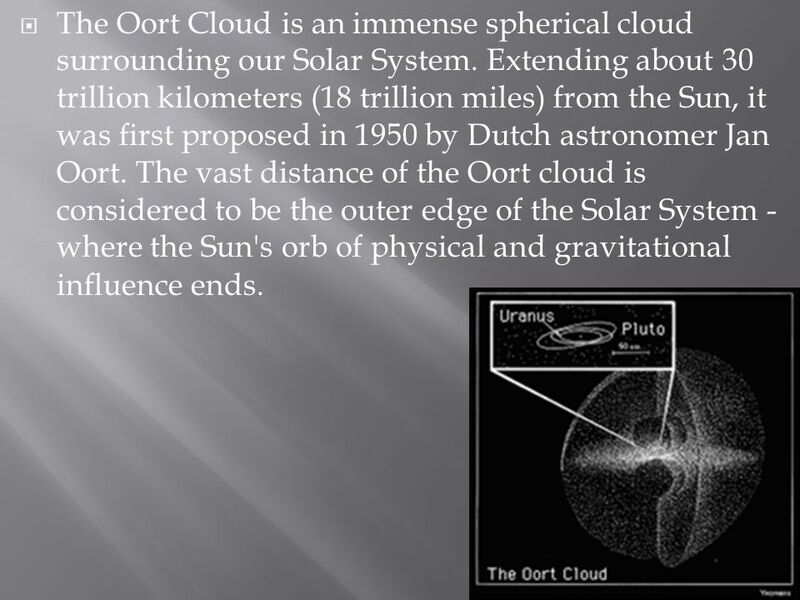 18 The Oort Cloud is an immense spherical cloud surrounding our Solar System. Extending about 30 trillion kilometers (18 trillion miles) from the Sun, it was first proposed in 1950 by Dutch astronomer Jan Oort. 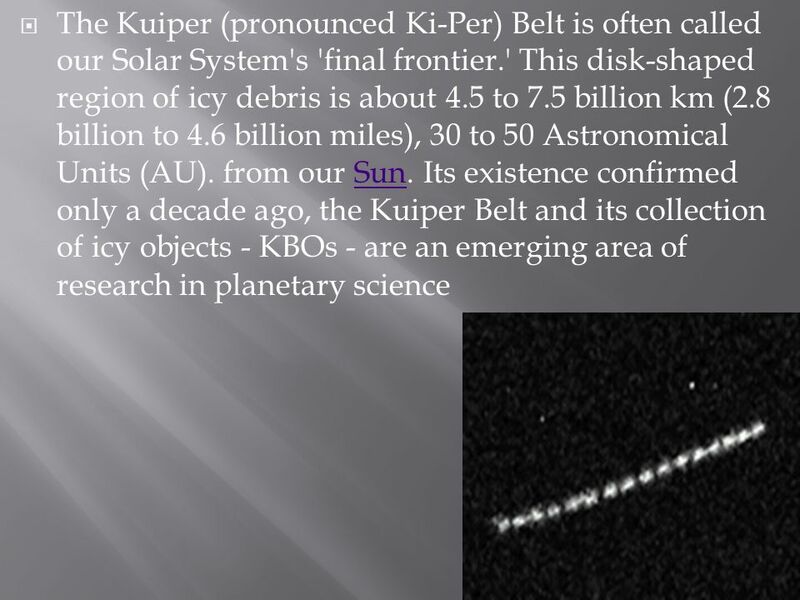 The vast distance of the Oort cloud is considered to be the outer edge of the Solar System - where the Sun's orb of physical and gravitational influence ends. 19 Moons in Brief Many of the moons of our solar system are as intriguing as the planets. Earth's Moon holds many clues to the formation of our home world and rest of the solar system and offers a potential starting point for humanity to extend its reach deeper into space. Jupiter's Europa and Ganymede harbor signs of possible subsurface oceans. Saturn's large moon Titan is the only moon in the solar system known to have clouds, a mysterious, thick, planet-like atmosphere and surface lakes. 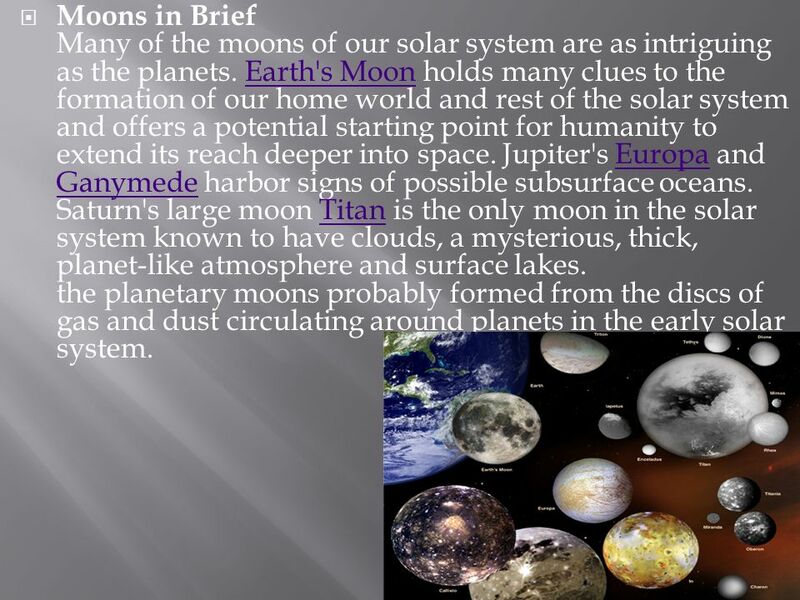 the planetary moons probably formed from the discs of gas and dust circulating around planets in the early solar system. 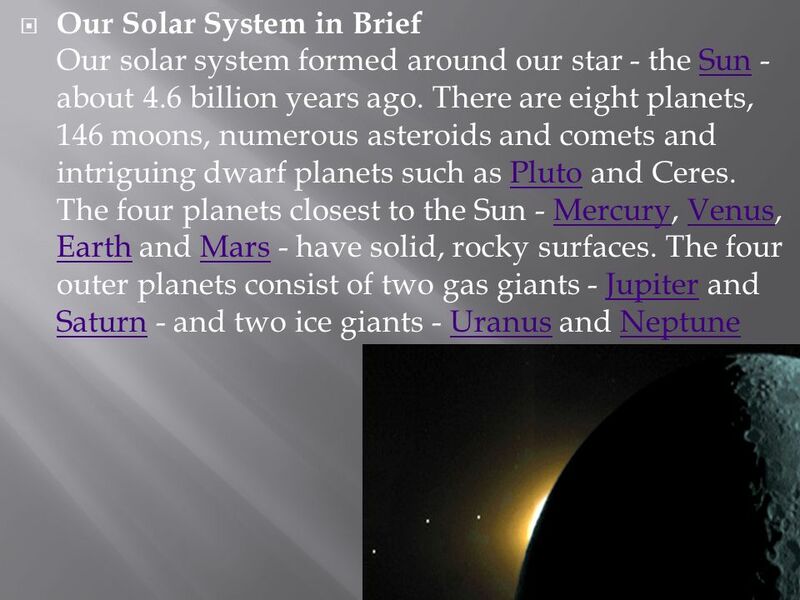 Download ppt "Planets in solar system"
Saturn By: Dyani Chock and Kaya Umeda. How it got it’s name Saturn is named for the Roman god of agriculture. The Greek equivalent was Cronos, father. Our Solar System. Your Parents Solar System 21 st Century Solar System. THE OUTER PLANETS. The first four outer planets- Jupiter, Saturn, Uranus, and Neptune- are much larger and more massive than Earth, and they do not have. The Universe. The Milky Way Galaxy, one of billions of other galaxies in the universe, contains about 400 billion stars and countless other objects. Why. Our Solar System Jeremy Nack. The Solar System An Interactive Learning Station. 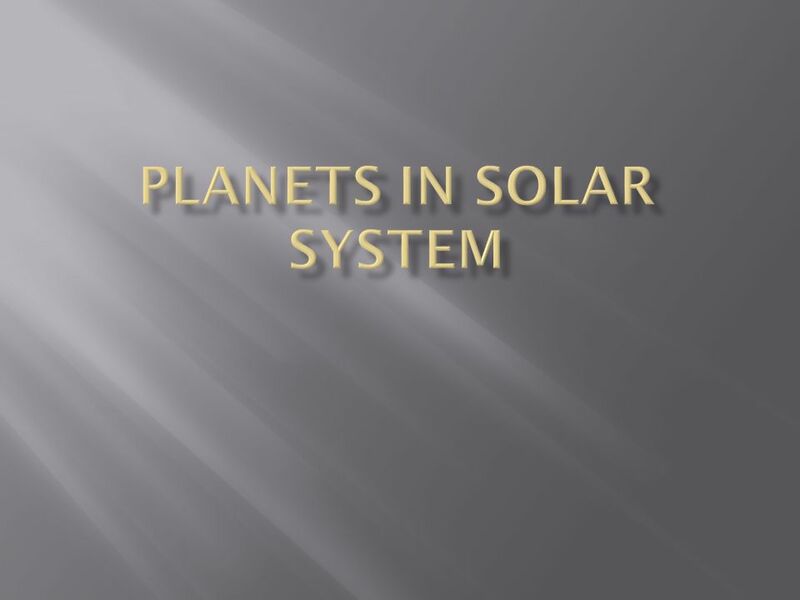 4-4 The Outer Planets The Solar System – Course 3. EUROPA: is the second closest moon to Jupiter. –It is completely covered with frozen water Some scientists believe that beneath the frozen water there.